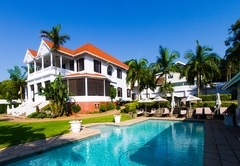 Audacia Manor Boutique Hotel is a Morningside boutique hotel providing accommodation in 10 guest rooms for tourists visiting the Durban region. 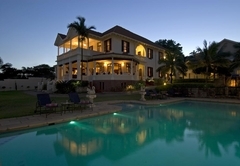 Built in 1928, Audacia Manor is a beautifully restored colonial mansion in a quiet residential area of Durban’s Berea. 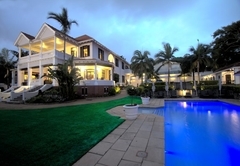 The manor is conveniently located close to the ICC, beach front and Moses Mabhida stadium. 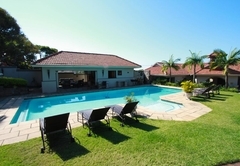 The stylish, individually decorated rooms have air-conditioning, heating, a mini bar fridge and DStv. Rooms have fully appointed bathrooms with a separate shower. 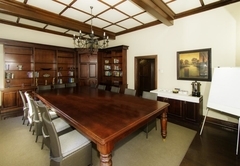 These rooms are furnished with King-size beds and have mahogany furniture. Five of the rooms have balconies. 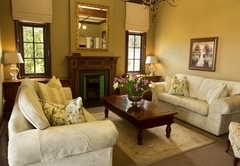 The rooms are furnished with Victorian, four poster King-size beds. Rooms have double vaulted ceilings and Oregon pine floors. They have a private courtyard with a jacuzzi and outdoor showers. Rates are inclusive of a delicious breakfast. 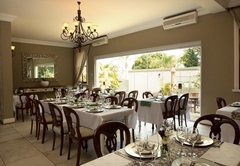 Other meals are served in the Ascot Dining Room, in the private wood paneled Epsom Room or outside on the verandah. 10 generously appointed rooms with King Size beds offering luxury and elegance in keeping with the traditions of the Manor House. 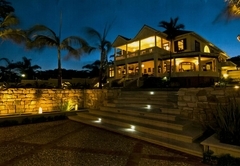 Graceful mahogany furniture compliments the generous rooms and five of the bedrooms offer balconies. 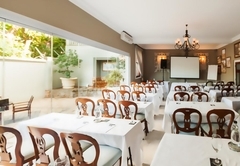 Response timeAudacia Manor Boutique Hotel typically responds to requests in 5-10 minutes.